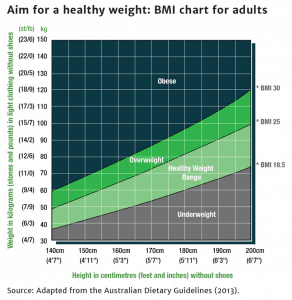 However, BMI is not always the best measure of your overall health. It’s not even the best way to measure whether you’re carrying too much or too little fat on your body. For example, an athlete may have a very high BMI, one that indicates being overweight. Despite having an “overweight” BMI, they may be very lean and fit. This is because muscle weighs more than fat. Another example, you can have a normal BMI, but if you’re very muscular, you may have too little fat on your body. This can cause fertility problems. Yet another possibility, your weight may be in the normal range, but you may carry more fat, and less muscle, than is healthy. If you’re concerned about your weight (or lack of fat, or too much fat), talk to your doctor. They can do a full evaluation. This will give you much more information than BMI numbers alone.